Maria Casino has been online since 2010. 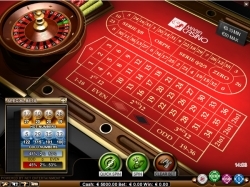 This casino is part of the Unibet Group, having evolved from the successful Maria Bingo. This provider of online bingo pulls in millions of players from across the world. Maria Casino, just like the trusty Maria Bingo, is very close to its players. The community makes online gambling fun. Maria Casino falls under the jurisdiction of the Lotteries and Gaming Authority (LGA) in Malta. Thanks to this regulator, you can rest assured that the online gambling is honest. The outcomes of its casino games cannot be influenced. At Maria Casino you can play all the games directly and with no downloads. The casino offers you flash games from NetEnt, which is known for its high quality and innovative casino games. Casino bonus 200% up to £20 With every deposit you receive a 200% bonus, up to a maximum of £20. Bingo bonus 200% up to £20 With every deposit you receive a 200% bonus, up to a maximum of £20. Bingo loyalty points 750 points will net you a €1 bonus Collect points with you bet at bingo, which can be redeemed for a bonus. Additionally, the casino often runs original promotions where you can win, among other things, holidays and cash prizes. Video slots: including Chuzzle, Zuma, Spiderman, Dallas and Gonzo’s Quest. Classic slots: including Gold Rush, Beetle Frenzy, Magic Love and Jackpot 6000. Jackpot games: including Mega Joker, Tiki Wonders, Mega Fortune and Arabian Nights. Table games: including roulette, blackjack, Caribbean stud poker, hi-lo switch and baccarat. Video poker: Jacks-or-Better, Deuces Wild, Joker Wild, All-American Poker and Classic Jacks-or-Better. At Maria Bingo you can play various bingo games from as little as €0.10! Bingo chat makes the game even more enjoyable, as you can talk to other bingo players in between. What sets Maria Casino apart from other casinos is that it has its own community. Here you can write a blog, share recipes and create a photo album. This give gambling a personal touch. You’ll get to know other players, and can share experiences with each other. Maria Casino’s English customer service is quick and accurate. Its customer service has long opening hours. It is available every day between 10:00 and 22:00, even on Sundays and holidays. Do you want to have your winnings paid out to you? You can do this from €15. How long it takes to get you your money depends on the payment method used. Withdraw via Neteller or Moneybookers and you’ll have your money within 48 hours, although a bank withdrawal will take three to ten days.